Slaughter and May published its gender pay gap statistics today, revealing a median hourly pay gap of 38.5%, and bonus pay gap of 54.8%. Like other law firms, this global figure is partly as a result of structural differences at firms, namely that there are many more women in lower-paid roles, particularly secretarial roles which are “all-female” at the firm. The mean hourly gender and bonus pay gaps for Slaughter and May are 14.3% and 33.3% respectively. Comparing male and female pay among associates there is a negative pay gap, meaning women are paid marginally more than men, with a mean pay gap of -2.1%, and a median pay gap of -0.8%. For bonuses, the mean pay gap for associates is -2.7%, while the median pay gap is zero. Among the highest paid employed jobs in London at the firm (excluding partners who are not employed by firms), where 47% are women and 53% are men, the mean pay gap is -2.3% and the median is -1.6%. Slaughter and May’s stats follow hot on the heels of Allen & Overy, that only yesterday revealed its own figures. These demonstrate the firm’s mean hourly pay differential of 19.8% and median pay at 27.4%. Linklaters was the first magic circle firm to publish its gender pay gap report with a mean hourly pay difference of 23% and median figure of 39%. But none of these law firm statistics take account of any possible gender discrepancies in the remuneration of non-salaried partners, a point picked up by Chancery Lane recently. On International Women’s Day last week, the Law Society’s president-to-be called on firms to publish figures for non-salaried partner pay as well as employees of firms. 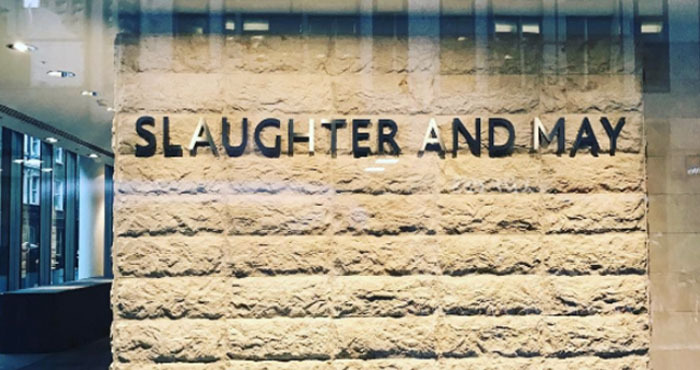 Both male and female newly qualified lawyers at Slaughters will now receive an £80,000 base salary following changes announced last December. Can’t a “negative pay gap” be equally accurately described as just a gap? Or is this feminist lingo to hide something you don’t want? Great to see you focussing on the real, important issues that women in the UK currently face. But what can I complain about now??!! Women get paid more than men! Yes, but there are fewer of them. Until it is exactly 50/50, or a negative discrepancy then it’s frankly not on. Lo and behold, people on a lockstep model are almost paid identically when you take out bonuses. I am so oppressed! Down with the matriarchy! “highest paid employed jobs” ???? For partner level, other important data to collect and compare on gender lines would be how long did a person work at the firm and how many years pqe before being made partner; how many of trainees/associates cohorts at each firm obtain partnership, etc. Knowing if a firm has consistently promoted more junior men or the 1 likely partnership available to any cohort of trainees goes to a man 80+ percent of the time is important information for applicants for training contracts or associate positions. KK must be trolling us all at this point. Isn’t a GENDER PAY GAP a PAY GAP nonetheless? Yes but if the gap shows that women are earning more than men then it’s considered to be a negative thing because misogynists have nothing to gloat about and feminists have nothing to complain about. Releasing the income differences in equity partners at major firms will create complete statistical chaos. Look at Freshfields: there was a report a year or two ago that showed a disparity of nearly £2 million between the highest paid equity partner and the lowest paid. Such discrepancies result from the value of work they bring into the firm that year, plus an endless multitude of factors from a lockstep system like seniority!